1. "The Curse of Kryptonite!" 2. "The Super-Servant of Crime!" 3. "The Town that Hated Superman!" Story #1. The Curse of Kryptonite! Between the Silver Age ACTION COMICS and SUPERMAN issues, my preference tended to be with the latter. SUPERMAN comics, for what seemed like at least the first half of the Silver Age, gave readers three distinct Superman stories (ACTION COMICS generally contained only a single Superman story). These 3-story issues were a delight and tended to follow a pattern: whereas two of the stories generally were serious or whimsical tales that could stand on their own, one story typically contributed to Superman lore and often added to the Man of Steel's rich and growing history. Such was the case with the first yarn in Superman #130, "The Curse of Kryptonite!" Here, Superman encounters an enormous boulder made out of Green Kryptonite. As the narrative writes, "like a drowning man facing death, Superman's flashing thoughts relive the facts behind Kryptonite..." While the painful rays of this dreaded mineral sink in, Superman reminisces to the destruction of his home planet, Krypton, which created Kryptonite as well as numerous situations in which he was able to escape or shield himself from the rock's deadly rays. The sequence even includes a seemingly unrelated but informative scene in which young Clark (Superboy) Kent melts his Krypton rocket's Plexiglas to create the famous "disguise" - his glasses! Superman then thinks back to a recent new addition to the Superman Family (new for the Silver Age, that is) - Supergirl, along with a narrative "plugging" her appearances in ACTION COMICS. Finally, another member of the Superman family appears and rescues his master - Krypto, the Dog of Steel! In a scene that touched the heart of this dog owner, Superman and his faithful hound embrace, not having been together since the days of Superboy. In the end, the Green Kryptonite is vanquished, but the story plants the seed for future tales with mention of the red variety of Kryptonite, which, per the narrative "distorts Superman's powers in fantastic ways!" Story #2. The Super-Servant of Crime! In this compact but fast-moving story, Superman is forced to do the bidding of a small-time crook, due to an apparent property violation by the Man of Steel. Of course, this bad guy is no match for the Caped Kryptonian, who grants several wishes in increasingly clever ways that provide no more than frustration to the criminal. In the end, the crook is jail-bound, and there is a neat twist that allows a local prospector (a good guy) his just rewards. Story #3: The Town that Hated Superman! Silver Age Superman stories often set up a situation that attempts to intrigue the reader until the mystery is cleared up - usually by the Man of Steel himself. This story is an example. Superman encounters a place where the Mayor has declared the Metropolis Marvel to be off-limits. Not only is he barred from entering the town, but anyone displaying any kind of affection for Superman - or even Super-paraphernalia such as a cape or a super-doll, is subject to arrest or fine! Eventually, Superman and the Mayor traverse the time barrier to reveal why the Mayor despises the Man of Steel. It turns out that the Mayor and young Clark Kent were in the same Smallville orphanage waiting to be adopted. Due to an incident there, the mayor believed that the young Superman was responsible for his not being chosen by prospective parents and, as he puts it "... (growing) up alone, unloved, unwanted" because he was never adopted. As such, he hated Superman and as Mayor put down his edict that clearly exhibited his deep and longtime feelings. In the end, Superman convinces the Mayor that he wasn't in fact responsible for his not being adopted. The Mayor realizes this and does a "180" - Superman becomes welcome in his town, after all. Story - 3: The mix of stories provides for great variety and entertainment. Whereas the first story about Kryptonite advances the overall world of Superman, the other two are wonderful standalone tales that move quickly and keep the reader's interest. Moreover, Superman is prominent in all three stories - never a background player as he sometimes can be, to Lois Lane or Jimmy Olsen, in stories centering on them. "The Town that Hated Superman! ", though, is contrived, and that's what brings down the overall story rating. While an interesting idea, the thought that someone would outlaw the world's greatest superhero is a bit far-fetched. Moreover, one would think that Superman's secret identity is at risk: after all, it wasn't Superman back in that orphanage - it was the boy who would soon be Clark Kent. The mayor could have easily learned that it was Jonathan and Martha Kent who adopted the babe of steel that he encountered so many years ago. Art - 4: Just as the stories provide a nice variety, so does the artwork - even more so. Though Al Plastino was not my favorite Silver Age Superman artist, he does a decent job. I wish his Superman didn't appear almost overweight and his action scenes not seem somewhat stilted and awkward, but he does just fine, overall. To me, though, the Silver Age Superman is all about Curt Swan (my favorite Superman artist) and Wayne Boring (my second favorite from that era). Whether with inkers Stan Kaye, George Klein or much later, Murphy Anderson, Curt Swan's distinctive pencils always shines. His work was magical. Though his style is quite different than Swan's, Wayne Boring's presentation of Superman was rarely, er, boring. There did tend to be awkwardness in his drawings that were akin to Mike Sekowsky of Justice League fame, but there's nothing like Boring's scenes of Superman seemingly walking on air. His portrayal of Superman made me "believe that a man could fly"! 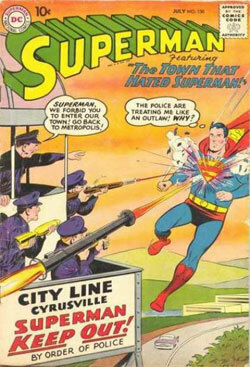 Cover Art - 3: The cover features the third story, "The Town that Hated Superman!" and shows police from Cyrusville firing at a flying Man of Steel with rifles and what look like small missiles! Of course, they don't affect him, but the result is to create an action-packed and intriguing cover. Superman's thought bubble "The police are treating me like an outlaw! Why?" made this reader harken back to the Man of Steel's early Golden Age days when the Metropolis police did in fact regard him as a bad guy - not a hero. All that said, the background is not all that rich in detail as Swan's covers can be and Superman's eyes and mouth seem a bit too white, dropping the rating a notch. Still, I'll take a Curt Swan-drawn cover any day.